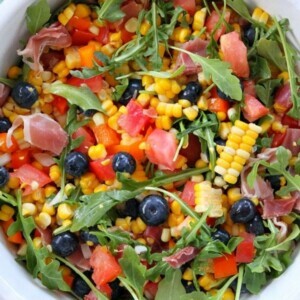 This Blueberry Corn Salad with Prosciutto is a really unique, beautiful and delicious summer salad for you to try. Watch the video showing you how to make this recipe, then scroll to the bottom of this post and print out the recipe so you can make it at home. I love all of the colors in this salad. It just SCREAMS summer, doesn’t it?? There really is a nice mix of flavors going on in this pretty salad. There are lots of vegetables- including arugula, corn, bell pepper, onion and tomato. 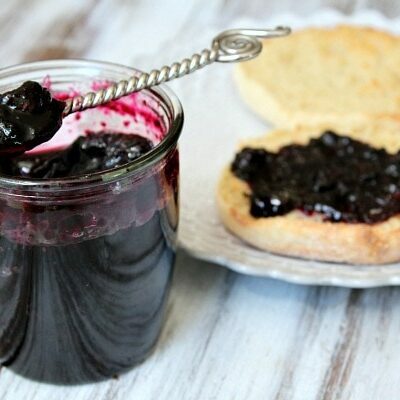 Sweet blueberries are mixed in too. And it’s all tossed with a simple, sweet honey lemon dressing. This recipe comes from a cookbook by Claire Gallam: Eat Skinny, Be Skinny- 100 Wholesome and Delicious Recipes Under 300 Calories. Author Gallam writes the fabulous blog, The Realistic Nutritionist –a mixture between low-fat, gluten-free, vegan and Weight Watchers meals. 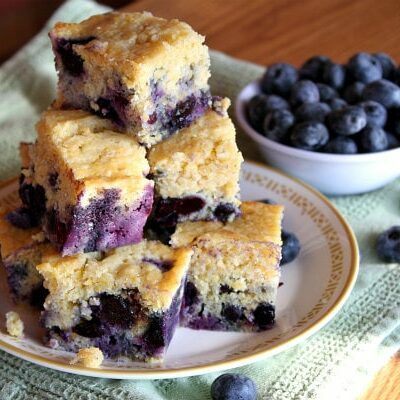 The cookbook contains the full range of recipes (breakfast, lunch, dinner, salads, cocktails and dessert) – all at less than 300 calories per serving. Nutritional information is included on every recipe. I must admit… I am totally a sucker for cookbooks that promise lighter recipes. And any cookbook that has “skinny” featured in the title is a big win too. I’m so excited to try these recipes from the book (though EVERYTHING looks awesome) > Creamy White Bean and Broccoli Dip, White Wine Slushies, Cajun Fish Tacos, Low Fat Diner-Style Biscuits, Easy Stovetop Mac and Cheese, Whole Wheat Banana Bread Bars and Roasted Strawberry Ice Cream. Doesn’t that all sound so good?? Okay, back to the recipe I made from the book- this totally pretty summer salad. So here’s the scoop. This recipe was the first one that caught my eye from the book. 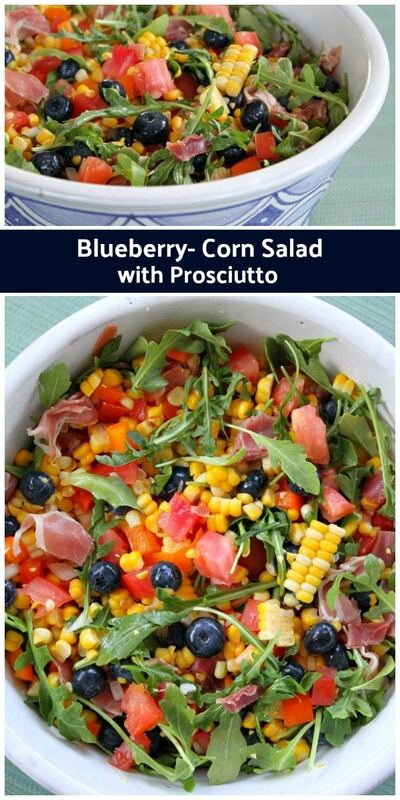 It seemed a little crazy… corn mixed with blueberries and prosciutto and tomato??? A little strange, right? 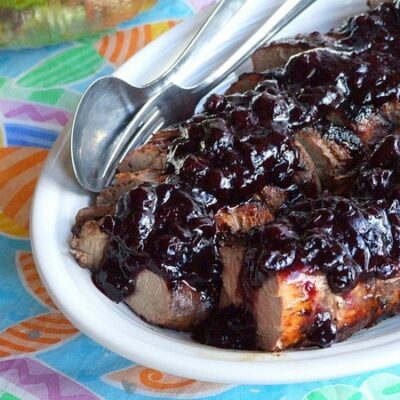 Well, I mixed it all up and served it at a barbecue with some neighbors. I was a little apprehensive to combine corn, blueberries and tomato in the same salad. It sounded kind of weird, yet it did seem intriguing. But it totally works. We all really loved it! The combo of the fresh corn, the sweet fruit and the salty prosciutto is delicious. It’s a neat blend of terrific, summery things, and it totally works! A couple of things: I love arugula a lot, and I think it would be great served over a nice bed of arugula too (instead of the arugula being mixed into the salad). But either way would work (since some people maybe don’t like arugula as much as I do!) Also, I think this salad would be just as good made with raw corn cut off the cob instead of cooking it. Again, I enjoy raw corn in a salad… so you’d have to decide if you like that too! In any case, it’s the perfect salad to make this summer- especially if you are entertaining or needing something to bring to a potluck. Enjoy! This is the perfect summery salad! Bring a large pot of water to a rapid boil and add a dash of salt. Remove the husks from the corn, clean off the silk strands, and then place into the boiling water. Boil for 3 to 4 minutes, then remove from the water and let the corn cool completely. Once cool enough to handle, hold the ear vertically and cut the corn from the cobs. Place the corn in a large bowl. Mix with the blueberries, chopped pepper, tomato and onion. Mix in 1/2 cup of arugula and add more if you'd like. Mix to combine. Stir in the prosciutto. In a small bowl, whisk together the lemon juice, olive oil and honey. Drizzle onto the salad and toss. Add salt and pepper, to taste. This salad really looks like the perfect summer lunch! Very colorful too! Prosciutto with berries and corn?! I LOVE IT!! !